You must make reservations at least 5 minutes in advance of the time at Hen Quarter - Alexandria. I have never given a bad review before but the service was one of the worst I have ever had and it was a brunch buffet!! Our server just had to do was bring us drinks, clear plates and bring our check and all of those things took forever. We had to ask at least 3 times just for water and finally got it half way through our meal. We never got refills of water or other drinks we ordered. We could see her standing around talking to coworkers so it wasn’t that she was busy. We were baffled. It turned out the service was just as bad for the table next to us and they were just as frustrated. It’s really too bad because the food was pretty good but I can’t go back with that kind of service. It ruined the experience. The Hen Quarter moved locations And although we were sad they are no longer in downtown DC we went to Alexandria specifically for them. Love the food, drinks and everything else! We went for the brunch buffet. Food was good, but was a little slow being refilled. A little on the pricey side. Drinks, apps, and food all came at once. Food was dried out fried chicken. Maybe for lunch; I thought dinner was good, but pricey. The food is pricey but delicious. The restaurant decor and feel is warm and inviting. The staff, with the exception of Jorge and Carlos (who is in training as a new hire as of 4/14/19) is subpar and not on the same level as the food and look of the restaurant. 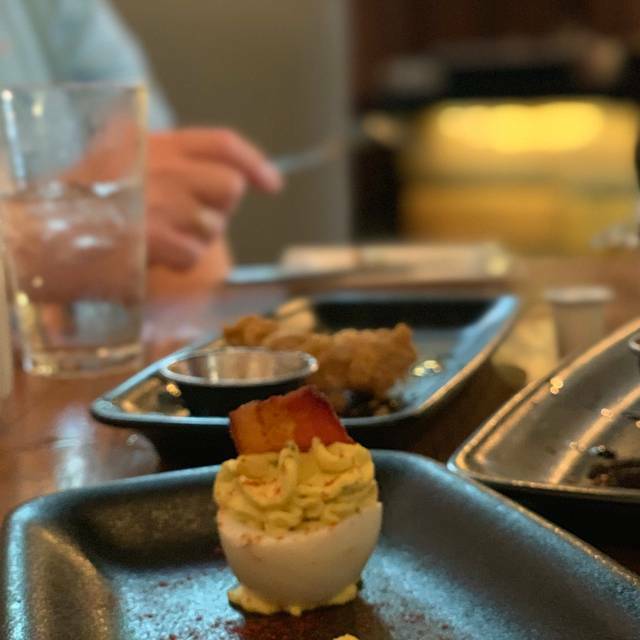 Hen Quarter in Old Town is like the owner came, built an awesome restaurant with a thought-out menu and look, and then left the restaurant to a manager(s) who is not present and does not care. The staff is unprofessional, immature, and do not want to be there. Our server/bartender who was in charge of training Carlos made sure to tell everyone left in the restaurant each time it was 15 minutes closer to closing time and loudly proclaimed to a clocked out staff member that it was her last day. This is not the only example I have of poor service there. I stomach the poor service because I love the food. I do not go as often as I would because of that poor service. It is clear the staff has a hiring manager who also does not care or we would have seen changes over the last 2 years. Train your staff and don’t hire the first person who applies or walks in off the street for a job. Customers paying $30/person for chicken don’t want that low-level service experience. 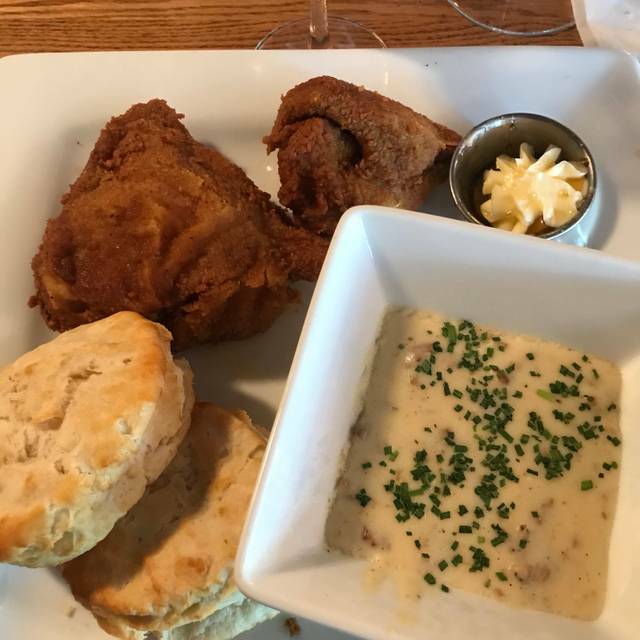 The best things about this meal were the cocktails, hush puppies and biscuits. The service was below average for that price of food .busboys nosily cleared the table next to us (practically throwing chairs out of the way). And the place was half empty. (But 8pm on a Friday night). We waited forever to get a glass of water and drinks... the fries that I ordered as a replacement side came out way ahead of the rest of my food. And the food was just average. I ordered the special fried chicken and there was nothing special about it. 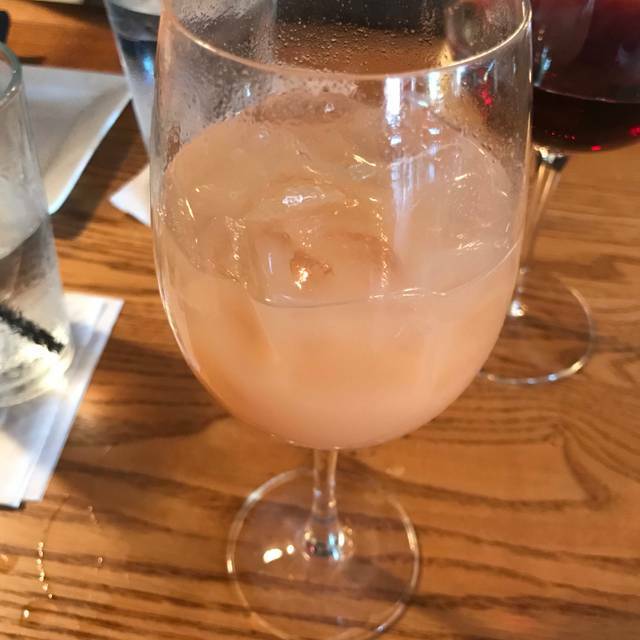 Oh and the glass was nowhere near a “full” pour for the cocktails. I wouldn’t go back - iy was okay but I’d rather spend my money somewhere that wants me as a customer and doesn’t premake the food. Great food! My wife and I cannot wait to go back!! Overall, the food was good. The shrimp and grits and chicken and waffles are delicious and there’s a nice assortment of beers. But we were very disappointed with the strawberry shortcake we ordered for desert - it’s more like a small dry cupcake with a little filling and a few strawberries. Not at all what we had in mind for a restaurant that advertised Southern cuisine. We asked to try something else and told the server we were disappointed with desert. 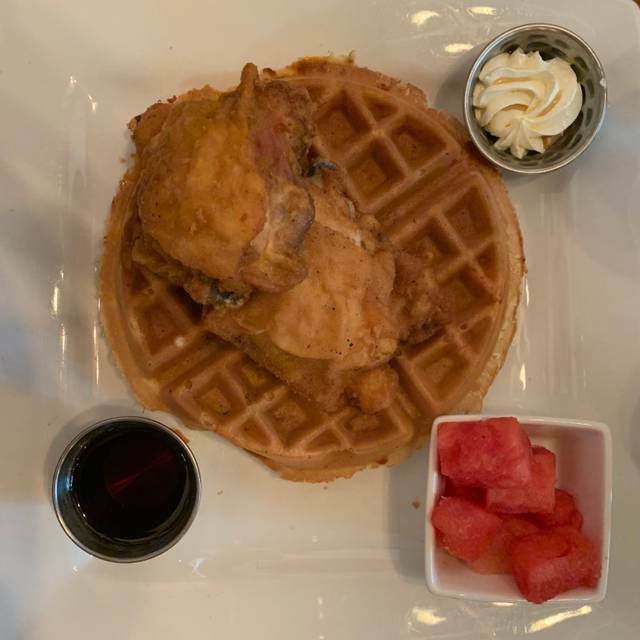 The fried chicken was excellent, so was the roasted chicken, shrimp and grits, and the chicken and waffles. The sides were scrumptious (Brussel Sprouts, mashed potatoes, sweet potatoes, green beans, and fries). Needless to say that my party left very clean plates from the yummy food. The catfish was amazing. The melon muddle drink was really refreshing. But...The table was very wobbly and I was afraid it would come crashing down. Nobody seemed very concerned. After I was done eating, someone removed the table, but didn't replace it with another one. I waited quite a while for the check and eventually I went up to the bar to get it myself. Hostess was lost and not great at communicating updates. I had to ask after the quoted wait went by and proceed to bar as we were early for the time. Bar tenders were pre occupied and waiting on back ups to come to make drinks, the waitstaff coming to pick up drinks were flustered and we overheard a lot of discussion about process and procedures. The server was amazing as was the food, but the wait for the food exceeded 30 min. From the table you could see at release 24 plates of food waiting to be organized to be taken to tables. We overheard the table next to us make the same remarks great food but poorly managed. Made a last minute reservation to Hen Quarter seeing that it was a family friendly spot on a spring Friday evening. Ambiance was really nice as their was live entertainment when you walk in. Service was great with our server, Briana, accommodating our two children’s request. In addition, she was really knowledgeable of the menu, etc. I ordered the Roasted Salmon dish that comes with grits. I substituted the succotash vegetable for collard greens. Needless to say, that particular dish was just overpriced at $27 for the value. Salmon was overcooked and the greens were pretty bland. Other than that, the kids and wife were satisfied with their food (MAC n cheese was pretty good). Good comfort food! The service was a little bit slow to bring orders but fine for a leisurely meal. Our server didn’t know the seasonal beers, and half the beers were out of stock on a Friday evening - I consider this especially odd going into the weekend, as they’ll miss out on sales. The drinks we got were delicious, the watermelonade was refreshing and sweet and the maple old fashioned was comforting. 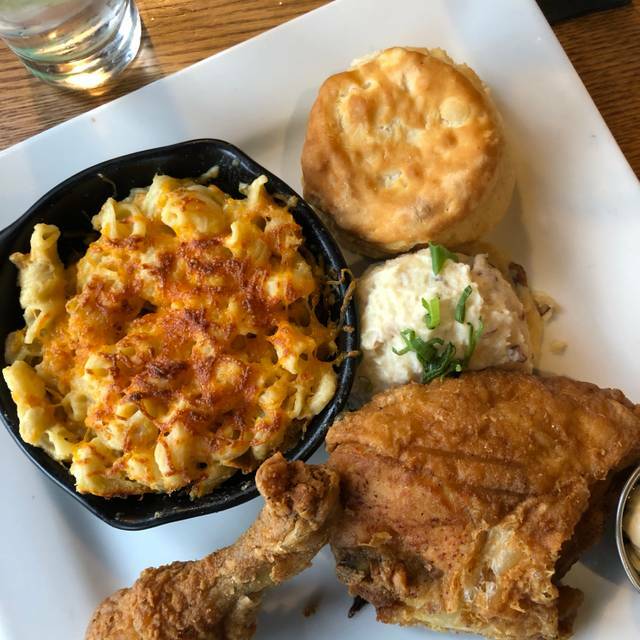 The food was delicious but seemed to vary in quality from dish to dish, the fried chicken wasn’t as freshly made and crispy as the roasted chicken for example. The fried green tomatoes, fried pickles, and roasted brussel sprouts were delicious! I would recommend this place overall. A slightly rough around the edges casual and family-friendly joint with satisfying food and drink. Excellent service. Comfortable ambiance. Salmon and succotash were excellent. They were out of some tap beers, Brussel sprouts were greasy, pork chop over cooked and collard greens were cold. We had fun, the food is solid but try somewhere else if you’re a foodie. Great food options for brunch but the buffet is expensive! $75 for brunch and we didn’t even have drinks. But the food was good and they had regular menu brunch options too so I would definitely go back and just order a regular meal rather than the buffet. Highly recommend upstairs seating. It has lots of windows seats to look out over King St. 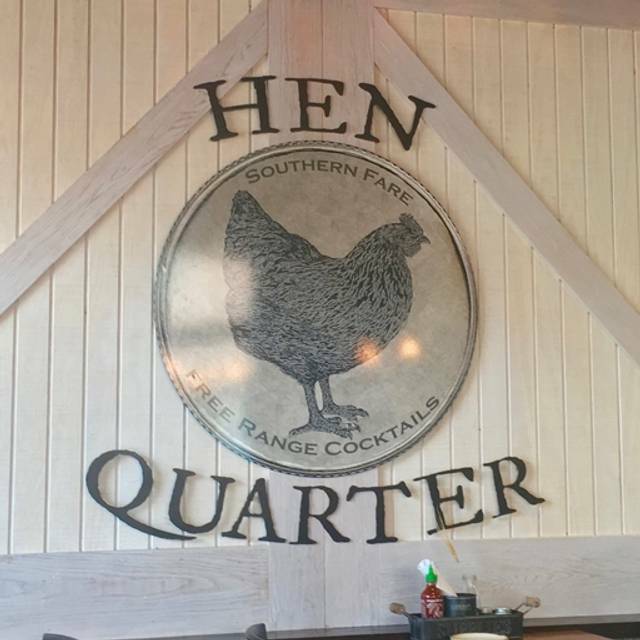 This is my third time at Hen Quarter for their brunch service. Any dish featuring their fried chicken is delicious; I had the fried chicken cobb salad this time. It was very refreshing with just the right amount of chicken and dressing. Service was the worst though -- our waitress kept ignoring our table and it took forever just to be served water (before our order was even taken). She only came over once to check in on us, did not refill our waters even once, and took a full 20 minutes to bring us our check (we timed it). What should have been a leisurely one-hour brunch, turned into a two and a half hour layover. When we left, the hostess didn't even bother looking up from her phone, let alone thank us for our visit or wish us a good day. The food here is very good, but the service left a bad taste in my mouth. I don't think we'll be coming back here again. The food is very good but the buffet is a little pricey. However you can always order from the menu. The food and cocktails are soooo good! Specifically, the fried chicken with collard greens and potatoes is delicious. The biscuits are also very good. The maple old fashioned is an awesome drink. The ambiance on the first floor is pretty neat - there is a table across from the bar that is private and great for a party of 4 or 5 people. Will definitely go back! 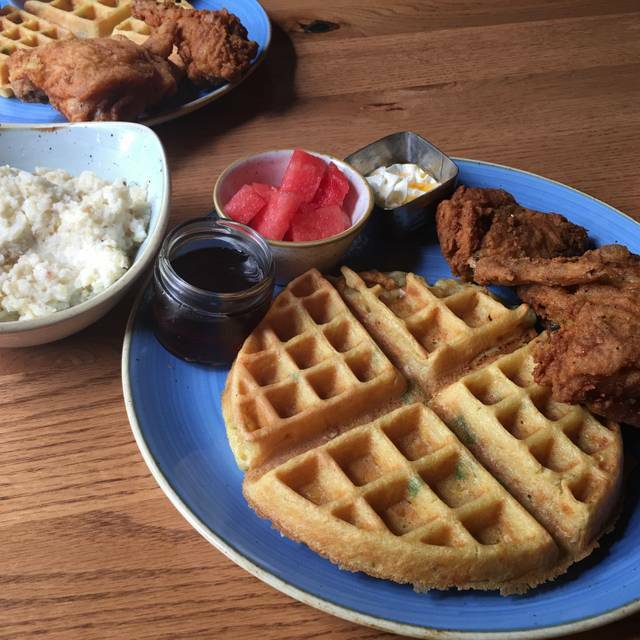 Fun southern food, cool space but the service is a bit slow. I’ll still go back for a soul food fix!! Service was terrible. Food is pretty good. Overall not worth it. Food was amazing. Service was awful. Had a good time. Didn’t enjoy my dish (baked chicken half) as much as I did my friend’s dish. It was my birthday and I got a free dessert and a hand written birthday card that was so sweet and unexpected. There was another party that was super loud but not the restaurant’s fault. Will definitely go back. Amazing Cat Fish, great Collard Greens and very friendly staff. We took a friend, visiting from Germany, to Hen Quarter to have a classic American brunch. If you've been to Europe, the breakfasts tend to be lighter fare. The Brunch Bar was everything it claimed to be; truly outstanding. We spent two hours there grazing and taking advantage of the bottomless Mimosas, Bellinis and Bloody Marys. If you're looking for a fabulous brunch on King Street with all the bells and whistles reserve a seat at Hen Quarter. 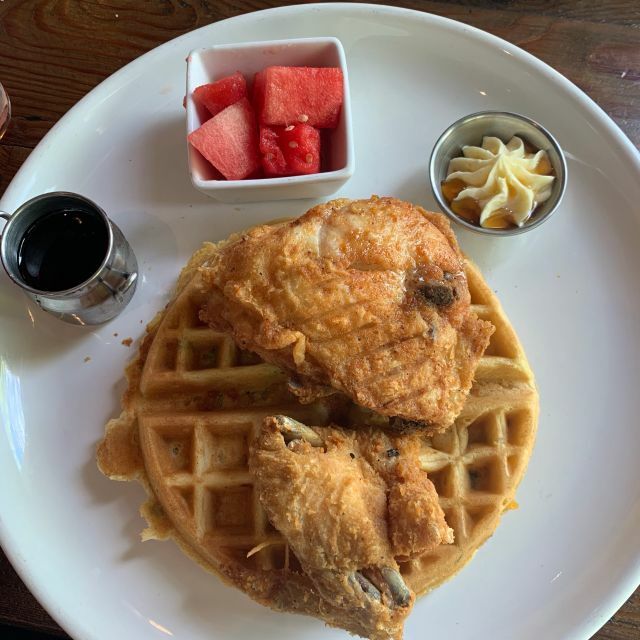 I was really excited about this place when I saw it pop up on my search but it ended up being just ok. Beautiful restaurant, service was a bit slow, everyone was nice and food left me a bit disappointed. I had the salmon dish - salmon was really good but succotash and spinach were salty and over cooked. I figured since it was a southern food type place, I should at least try the fried chicken and biscuits. I was really sad when the chicken came back super dry and under seasoned. I would give this place a second chance and maybe go a bit later in the day. I went right at the start of service and sometimes things are always at there best yet. I came to this restaurant with a girlfriend that I had not seen in a few years. It was cute, quaint and the wait staff were fast and professional. The food was delicious! 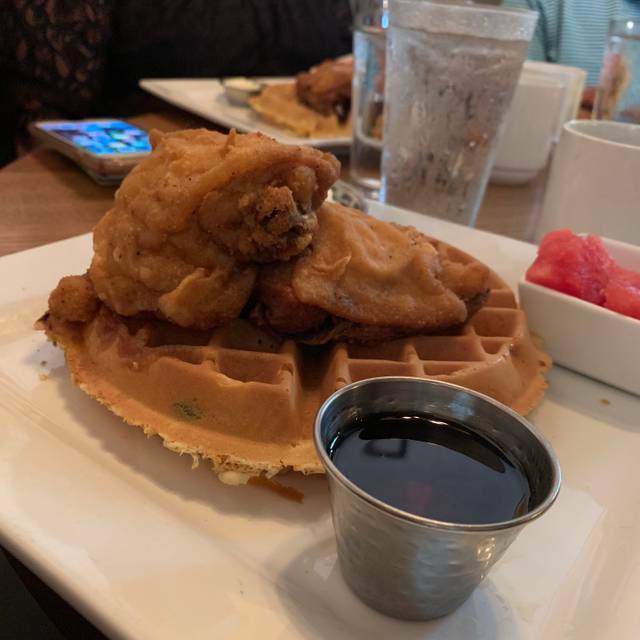 Everything that we ordered (fried pickles, delviled eggs, wings, chicken and waffles, belly pops and biscuits) was AMAZING! I’d order everything in one sitting all over again. Not sure if it was just the time we came here but overall I was not impressed in the least. While the restaurant has some nice ambiance and is decorated well the service and food were quite lacking. We arrived around 430p. There wasn't a single patron in the restaurant. You might expect to get paid attention to but that was not our experience. I ordered the fried chicken and for the price, it was just not worth it. Everything was overpriced that we ordered but it's Old Town so that may account for it as rent isn't cheap. As more of the dinner wait staff arrived we noted how well the new patrons were greeted. So it may just have been a case of our waiter being tired and at the end of his shift. Not my problem! I won't be back. The experience and food were disappointing. Food was lukewarm, service was slow urge point if non existent. Great place to have a variety of food! This was a birthday dinner for my mom and at the end of the night she was pleased, and we all were very pleased. They provided a birthday card, a gift certificate, and a wonderful cake to seal the deal. I couldn't have wanted anything better. Great thought!! Unfortunately I was hoping for a better experience here. My friends and I made a reservation for 3 at 7pm but they somehow messed it up and thought we were 7 people. No big deal, or so I thought. They sat us at a table for 4. While we got to chatting and realized 20 minutes had gone by without someone to greet us. I went and alerted a manager as a server was no where in sight. A server came by shortly after and we gave our food and drink order (wine). 25 minutes pass after giving our order and we still do not have water or our other drinks we ordered. By this time, it's almost and hour after we have sat down that we still do not have drinks or water. My friend goes to alert the manager again. He brings back biscuits and aplogizes for the wait. I inform him thank you for the gesture but I have a gluten allergy and asked if there was something else he could bring. He says to me "I'll see what I can do" and never returns. Water arrives shortly after along with our food but still no wine! The food was okay. I got a grilled chicken salad. I was just happy to have food and water. The server came back to apologize for the wait and took responsibility. It did seem they were short staffed so perhaps this was a management problem. However, the manager never came back to check on us. We received our check with no comps and left all agreeing we'd never be back. Sorry I don't have better news to share!